Weight: 0.81 oz. 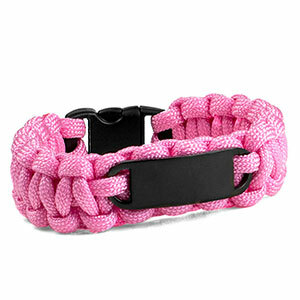 / 23 g.
This pink bracelet not only contains paracord - a strong material also known as parachute cord - it also happens to be quite trendy! In extreme cases, the bracelet can be cut to create a strong rope. After doing this, it cannot be reassembled. Laser engraving creates a sharp, lightly contrasting message, monogram, symbol and more.